After her healing, Rita began spending time with Rhoda Wise. Rhoda became a sort of spiritual mother to her, helping her grow in holiness. Rita gradually expanded her prayer life. On her way home from work or school she would stop at St. Anthony's Catholic Church and make the Stations of the Cross. She felt the Lord call her to a deeper relationship as she gazed at the statue of Our Lady of Sorrows. Against her mother's wishes Rita secretly entered the Poor Clares community in Cleveland, Ohio. In time her mother came to deal with the situation. 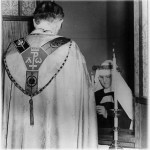 Rita formally entered the Poor Clares on Aug 15, 1944. Shortly after her vows, Sr Angelica was chosen to form a new community in Canton at the Sancta Clara Monastery. The sisters received a gift from John F. O’Dea Jr. He had built a 24-room Tudor mansion for himself and his wife, Ida. 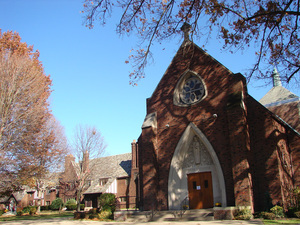 In August of 1945, the O’Deas offered the 15-acre estate to the Catholic Diocese of Youngstown as a site for Eucharistic Adoration. Within a year, the Poor Clares of Perpetual Adoration, cloistered nuns whose first American order was based in Cleveland, moved onto the grounds to expand their mission.